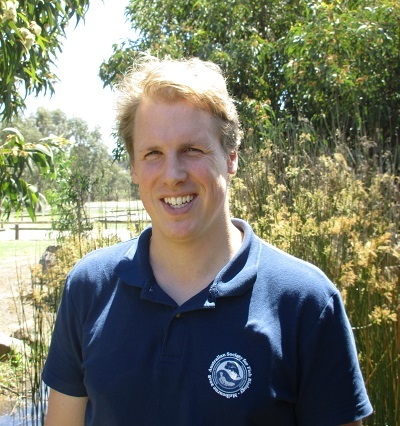 Conservation biologist Dr Alex Bond, who is the Senior Curator in Charge of Birds at the Natural History Museum in London, visited the Institute and CSU's Albury-Wodonga campus in December and gave a talk on December 5 on "Trash Talk; The story of the Shearwater and the Bottle Cap." Visiting the Institute twice in November for a couple of weeks at a time was PhD student Sam Perrin from the Norwegian University of Science and Techn ology. Sam, whose PhD is looking at the effect of climate change on freshwater fish communities, particularly invasive species, was here to write a collaborative paper with Dr Keller Kopf and to do some field work for a project Keller leads Native and invasive fish dispersal, spawning and trophic dynamics during a managed river-floodplain connection. 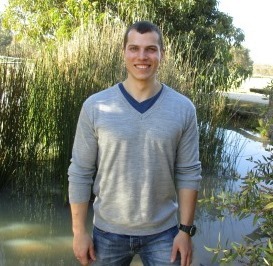 Eduardo Brambilla, a student at Brazil’s São Paulo State University (UNESP), is in Australia for six months (August 2018 to February 2019). While here he has the opportunity to acquire ground-breaking new knowledge by being involved in the Institute’s research work for the Snowy 2.0 project, and other fish related research projects both in Australia and overseas. He is working with the Institute’s Dr Lee Baumgartner, Dr Luiz Silva and other members of the ILWS team. Eduardo is on a scholarship from the Brazilian Council of Higher Degree Programs (CAPES) via a program of the Brazilian Federal Government to provide for international exchange of higher degree students. Eduardo’s PhD project aims to understand the impacts of a cascade of three small hydropower plants on the reproduction and recruitment of migratory fish populations in South Eastern Brazil, by looking at the distribution, composition and abundance of fish eggs and larvae in the system. 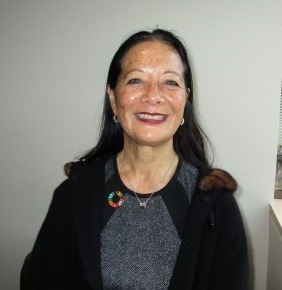 Special guest at a one day workshop "Engaging with Sustainable Development Goals" at Albury-Wodonga campus on October 18 convened by Professor Manohar Pawar, was Ms Patricia Garcia, AO, National Program Manager UN Sustainable Development Goals, United Nations Association of Australia (UNAA). The aim of the workshop was to brainstornm potential ILWS engagement with the SDGs in terms of grants and interdisciplinary perspectives. International academic scholar and First Nations Human Rights activist Professor Cindy Blackstock from Canada visited CSU Bathurst as a Visiting Scholar, August 27 to 31. While here Professor Blackstock, whose visit was funded by the Faculty of Arts & Education, gave a public lecture on “Indigenous ways of doing moral and respectful courage” on August 28. Her visit also provided an opportunity for CSU researchers to engage with Professor Blackstock to develop an “Indigenous Knowledges Stream” at CSU. 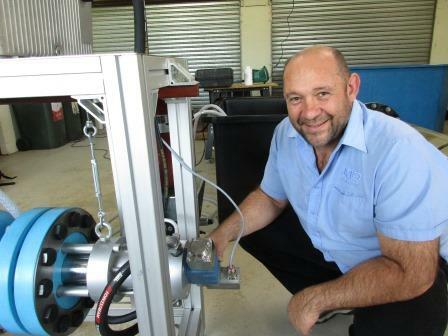 Jan du Preez, from JAD Systems, was in Australia in June for a week to work closely with ILWS staff to install, commission and train researchers to use his Fast transient Hyperbaric Chamber. This special piece of laboratory equipment, which Jan designed and built overseas (in the U.S. and South Africa) is being used for Snowy Hydro project, Predicting redfin survival through the Snowy 2.0 scheme. Assignment 2. 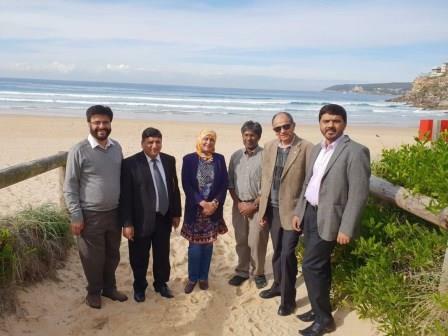 Five economists from the Institute's groundwater project in Pakistan were in Australia May 26 to June 3 to attend a training program in Sydney where they learnt how to use MAD (Mobile Acquired Data) applications for collecting survey data. While here they met with project team members Associate Professor Catherine Allan, Dr Michael Mitchell, Dr Jay Punthakey and Dr Richard Culas. Dr Judy Dunlop, co-supervisor of ILWS PhD student Harry Moore, visited the Institute on Wednesday, March 21. Judy, who works for the WA Department of Biodiversity, Conservation and Attractions, was visiting the east coast for the historic release of 20 Eastern quolls into Booderee National Park at Jervis Bay on Tuesday, March 13 - marking the return of the mammal to mainland Australia for the first time in 50 years. 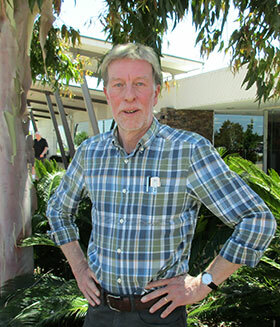 Her time at the Institute included meeting with A/Prof Dale Nimmo, Harry's other supervisor, catching up with friends from early research days, and a presentation to members of the Institute on 'quolls and rockholes in the Pilbara region' at the Albury-Wodonga campus. 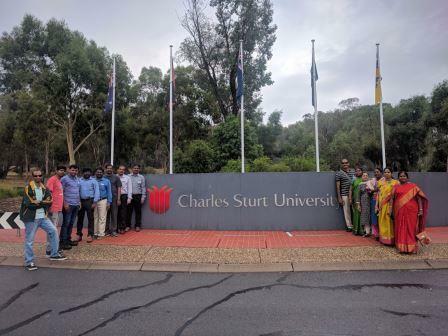 A group of water managers from Talanga and Andhra Pradesh, India visited Australia on a ICEWaRM technical tour in January. The NSW leg, led by Dr Kelvin Montagu, focussed on water management along the Murrumbidgee River. The group spent three days in Griffith talking to growers and water service providers to understand water entitlements, allocations and trading and how this improved water productivity. The management of environmental water then became the group's focus as it followed the Murrumbidgee River up-stream and, on January 25, the group met up with ILWS member Dr Julia Howitt and CEWO’s Madeline Gorham at CSU's Wagga campus. The pair gave presentations that provided greater insight into the management and complexities of environmental water. Dr Lee Baumgartner, Dr Luiz Silva and Mr Vu Vi An hosted a delegation of scientists from Indonesia who were interested in learning about fish passage and potential applications in tropical systems in December.The delegation included Dr Arif Wibowo and Dr Vipen Adisanh who were treated to a tour of Southern NSW and the ACT.The delegation stopped at the Yarrawonga fishlift, various fishway sites in Deniliquin, Narrandera Fisheries Centre, Charles Sturt University in Wagga and ACIAR in Canberra. 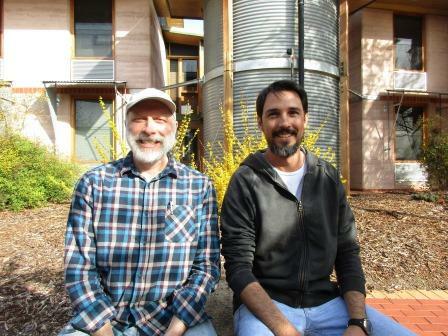 Visiting scholar André Vieira Galuch (pictured right next to Dr Paul Humphries) is a PhD student from Brazil based at CSU's Albury-Wodonga campus for four months. A student of the course of Freshwater Biology and Inland Fisheries (BADPI) at the National Institute of Amazonian Research (INPA), in Manaus, Amazonas, Brazil, André hopes to complete his PhD; to work with fish ecologist Dr Paul Humphries and to learn more about their mutual study area – the dispersal of larval drift in relation to flow. His visit has been sponsored by Brazilian Federal Agency for Support and Evaluation of Graduate Education. His PhD is on "Larval fish and the impact of dams on the Madeira River," one of the largest tributaries of the Amazon River. He is studying the effect of the Santo Antonio Dam, building for which began in 2008 with the dam coming into operation in 2012 with two turbines, on larval fish in the river upstream and downstream of the dam. Two of the Institute's Adjuncts Professor Nick Davidson and Mr Rob McInnes were in Australia in October for a week to work with other Institute researchers on an international citizen-science project on the state of the world's wetlands. The project, a 'citizen-science' survey on the State of the World's Wetlands, was launched in May this year and ran for five months. The volunteer project is a collaboration between ILWS; the Society of Wetland Scientists, (particularly its Ramsar section of which Rob is a past chair and Nick the current chair); the World Wetland Network, a network facilitating engagement with local (mostly community based) wetland related NGOs world-wide; and the Wildfowl & Wetlands Trust. 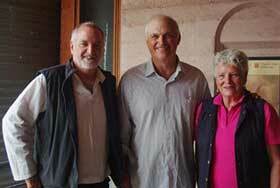 The visit in October was Institute Adjunct Professor Nick Davidson second visit to Australia this year. He was also here in August primarily to attend a National Climate Change Adaptation Research Facility (NCCARF) workshop in Brisbane. Dr Gordon O'Brien a principal scientist from the University of Kwazulu-Natal, in South Africa, who specialises in fish ecology, visited Australia in September. 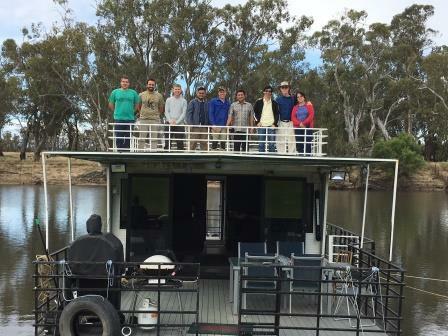 While here Dr O'Brien visited the Yarrawonga Fish Lift, for the first lift of the season. 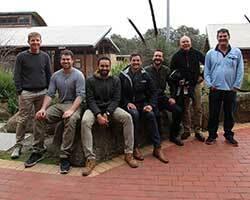 Seven Fishy Amigos - were at the CSU Albury-Wodonga Campus August 3, discussing experimental approaches for the Fishing for Answers project, which is funded by the NSW Recreational Fishing Trust. The objective of the meeting was to plan out their experimental approach and develop a workplan for the coming 12 months. Visitor to the Institute in March for a couple of days was Associate Professor Martine Maron from the University of Queensland's School of Earth and Environmental Sciences. While here Associate Professor Maron presented a seminar on "Biodiversity offsetting and no net loss in dynamic landscapes" attended by about 30 people including staff and NRM agency representatives from the NSW Office of Environment & Heritage, and Department of Environment, Land, Water and Planning, at the Albury-Wodonga campus on March 15. Two international visitors to the Institute in February were Professor Ken Irvine, from Delft-IHE's Water Science and Engineering Department, is Chair of the Aquatic Ecosystems Group and Dr Doug Shaw, the Associate State Director for The Nature Conservancy in Minnesota, North Dakota and South Dakota, running its conservation programs in those states. The two were here to attend a he three day workshop "Myanmar Project Partnership Opportunities", held on CSUs Albury campus, February 7-9. Insititute adjunct Prof Nick Davidson was in Australia for a short visit in November during which time he attended a meeting of Associate Editors of the journal Marine and Freshwater Research in Melbourne, and met and worked with colleague Institute Director Professor Max Finlayson, Editor-in-Chief of the journal. 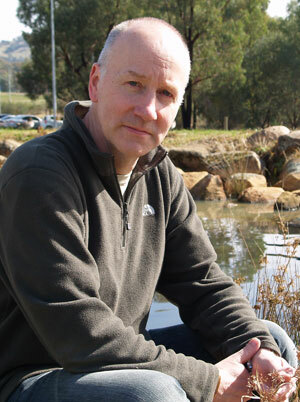 One of the reasons he was in Australia, with support from the Institute, was to do some development of the Society of Wetland Scientists (SWS) Ramsar Section-led project, which includes developing a citizen science approach through a simple questionnaire. While here he also met with Institute adjunct Dr Mariagrazia Bellio to benefit from her experience of developing such qualitative questionnaires and how to analyse the responses. 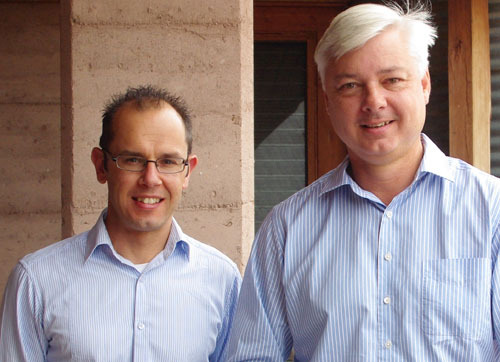 Visiting Academic Professor Luiz Silva, from the Federal University of Sao Joao del-Rei (UFSJ) in Minas Gerais, Brazil, will be based at CSU's Albury-Wodonga Campus for 18 months. Luiz, a fish ecologist, has research interests in fish passage, fish mortality from hydro-turbines (hydropower), and the impacts on fish from water infrastructure in general. He will be working with colleague Dr Lee Baumgartner. The two are members of a global programme, the International Energy Agency Technology Collaboration Programme on Hydropower - Annex XIII: Hydropower and Fish - of which Australia and Brazil are both members. Accompanying Luiz is his wife Lorena Nogueira, who is doing her PhD on fish eggs and larval drift, at La Trobe University, Wodonga. Associate Professor Aida Abdullah from the National Defence University of Malaysia visited Bathurst on July 9 to discuss human and wildlife coexistence. Aida met Associate Professors Peter Simmons and Chika Anyanwu and Dr Michael Mehmet in the School of Communication and Creative Industries. Peter, Michael and Aida are designing a study to explore and measure attitudes to coexisting with wildlife generally, with a focus on kangaroos in Australia and monkeys in Malaysia. Visting Academic Associate Professor Mingwei Li from the school of Business, Hebei Agriculture University (HAU), Baoding, China is based at the CSU's Orange Campus, School of Agricultural and Wine Sciences (SAWS) from December 2014 - November 2015. While in Australia, A/Prof Li is working with Dr Richard Culas on "performance evaluation of agricultural development project in relation to small scale irrigation projects in China". Visiting from the University of Otago, New Zealand, Dr Bruce Robertson and his wife Fiona, spent a week in May catching up with colleague Institute member Dr Melanie Massaro. Bruce, a zoology lecturer, specialises in conservation genetics and wildlife management and he was in the Albury-Wodonga region catching silvereyes as part of a project funded by the Royal Society of New Zealand's Marsden Fund. 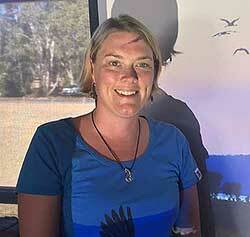 Fiona is a Research Associate in the Robertson Conservation Genetics Lab at Otago University. 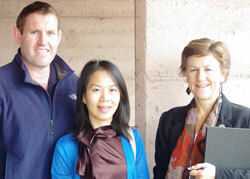 Making a quick visit to the Institute on March 16-17 was Cr Joan White from Goondiwindi Regional Council. Joan, who comes from Texas near the Queensland/NSW Border, was here as a representative of the rural communities in the northern part of the Murray-Darling Basin. Joan, a member of the Border Rivers Environmental Water Network, is on the Interim Board of the Regional Centre of Expertise--Murray-Darling which met yesterday at the Albury-Wodonga campus to begin developing a strategy to engage with stakeholders across the Basin. "We are losing the people who are looking after the land," says Joan. "Rural communities are really struggling. I'm here to look for ways that we can work together, to motivate others, so we can have social and economic sustainability, better land and water management, social cohesion and connectivity, and maintain general health. The RCE-MD can broker relationships and connections to make that happen." Dr Tom Wengraf, Honorary Senior Research Fellow at the Birkbeck Institute for Social Research, London University and Dr Prue Chamberlayne VisitingSenior Research Fellow, Open University, United Kingdom were in Australia in February to run a five day intensive workshop (February 20-25) in Wagga Wagga for nine CSU researchers. The pair are experts in a social research technique called Biographic Narrative Interpretive Method. "This was a wonderful opportunity to hear from leaders in the field and is an example of how the University is working to develop new research skills and the capacity of our researchers with the help of world class trainers," said workshop organiser, Professor Manohar Pawar said. 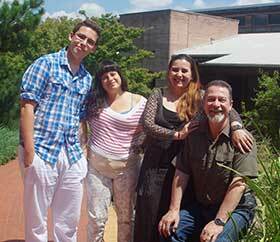 Visitors to the Institute in January were Professor Victor Marin, his wife Professor Luisa Delgado, both of whom are from the University of Chile, Santiago, in South America, and their son Ignacio Marin, 16. Professor Marin and his wife, who were in Albury for four days, are writing a paper with Institute Director Professor Max Finlayson, on the complexities and uncertainties in socio-ecological systems based on the example of the Rio Cruces wetland in Chile. A group of Indonesian journalists visiting Australia as part of the Asia Pacific Journalism Centre 5-week fellowship came to ILWS on the morning of Thursday August 30 to learn more about business and environmental issues particularly on the theme of "Why water matters" with a discussion on food security and water management issues with Institute Director Professor Max Finlayson and Associate Director A/Prof Vaughan Higgins. Their visit started with a Welcome to Country, followed by a talk on the Indigenous perspectives of environmental management by ILWS researcher and Wiradjuri elder Yalmambirra. Institute visitor in August 2014 was Professor Guoqing Shi, an eminent social researcher from Hohai University, Nanjing, China. While here Professor Shi renewed a MOU between Hohai and CSU (he helped instigate the original MOU signed in 2007); gave a seminar on "Social, economic and environmental impacts of large scale water projects: Three Gorges Dam and South to North Water Transfer Project" at the Albury campus on Wednesday afternoon; and discussed potential collaborative research projects with Institute members including Institute Director Professor Max Finlayson and Sustainable Water Strategic Research Area leader A/Prof Robyn Watts. Professor Shi is also a co-supervisor of ILWS PhD student Ms Yinru (Ruby) Lei. 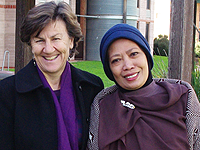 A visitor to the Institute for three weeks during July was Dr Mardiana Fachry (pictured with Dr Joanne Millar) from Hasanuddin University, Sulawesi, Indonesia. Dr Fachry, a social scientist working in fisheries, conservation, gender and rural development is a colleague of the Institute's Dr Joanne Millar. They work together on an ACIAR funded project Diversification of smallholder coastal aquaculture in Indonesia (2011 to 2015) led by the University of Sydney, for which Prof Fachry did most of the social research in Sulawesi, and Dr Millar in Aceh. Dr Fachry established seven farmer groups in Sulawesi who trialled three complementary species to shrimp: tilapia, crabs, and lawi-lawi (a seaweed). She then evaluated how the groups organised themselves and interviewed members on the pros and cons of diversifying commodities. The two have also worked together on another ACIAR funded project, Informing productivity and profitability of small-holder shrimp aquaculture and related agribusiness in Indonesia (2009-2011) and run training courses for fisheries scientists in qualitative and quantitative social research methods in Sulawesi and Aceh. Dr Fachry is a lecturer in socio-economics with the Faculty of Fisheries and Marine Science, and while here she presented a seminar with Dr Millar on the Albury campus and worked on a journal paper from her survey results. "We are hoping to get three journal articles out of the research, two on the surveys in Sulawesi, and one on the research done in Aceh," says Dr Millar. While in Australia, Dr Fachry spent a week at the University of Sydney, discussing a new ACIAR project looking at grouper hatcheries (sea cages) on the north coast of Bali. This was her fifth visit to Australia. For her first visit, in 2002, she spent six months at the University of Adelaide working on gender mainstreaming (ensuring women are included) research for a Sulawesi government program. Dr Fahry says she is hoping for further collaboration between the Institute and her university's Environmental Studies Centre. Four biologists from Papua New Guinea gave a fascinating and informative presentation today on their various research projects in PNG in the School of Environmental Sciences' tea room on campus at Albury-Wodonga. The four visited CSU to participate in a wildlife health & disease training program being run by the School of Animal & Veterinary Sciences at Wagga. The four, three (Tania Areori, Daniel Okena and Heather Taitibe) from the PNG Institute for Biological Research, and one (Wallace Takendu) from the Wildlife Conservation Society, are working on some very cute species including the Silky Cuscus and the Long Beaked Echidna. They provided an excellent insight into some of the challenges facing wildlife conservationists in PNG. Charles Start University and the New South Wales Department of Primary Industries hosted a visit by Dr Malavanh Chittavong, from the National University of Lao to Albury campus on Thursday 27th March 2014. Dr Chittavong, a senior academic in the Faculty of Agriculture was awarded the John Dillon Fellowship by the Australian Centre for International Agricultural Research (ACIAR) to spend six weeks in Australia learning about research management and fisheries research. Dr Chittavong has been involved in an ACIAR project in Laos that has installed the first ever fish passage designed specifically for Mekong River fish species. Whilst at CSU Albury campus, Dr Chittavong and Jarrod McPherson from the Narrandera Fisheries Research Centre met with ILWS social researcher, Dr Joanne Millar. Dr Millar is conducting surveys of villagers around the fishway in Laos to determine the social and economic benefits from fish returning to a wetland from the Mekong River (see project profile). The next survey will be conducted in November 2014 to see if villagers have observed any increase in fish numbers or species over two years as a result of the fish passage. Natural Resource Management issues faced in Canada are not that dissimilar to those in Australia according to Randy Milton, Manager of Wildlife Resources with the Ecosystems and Habitats Program, with the Department of Natural Resources in Nova Scotia, Canada, who visted Prof Max Finlayson in March. 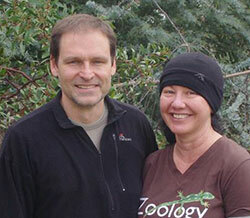 Randy first met Max in 1999 at a Ramsar meeting in Costa Rica. 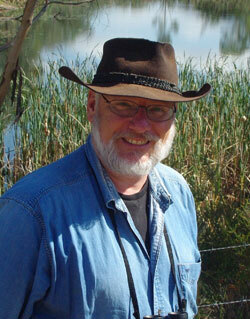 Like Max he is a member of the Ramsar Convention on Wetlands' Scientific and Technical Review Panel (STRP). The two have worked together on the United Nations Environment Program's Millennium Ecosystem Assessment, a couple of academic papers, and, as STRP members, on documents for various resolutions. His week- long visit to Australia in March was a social one – to catch up with Max for his 60th birthday and "to get away from two metres of snow back home." Professor Cui Lijuan, who is the Director of the Institute of Wetland Research, Chinese Academy of Forestry. 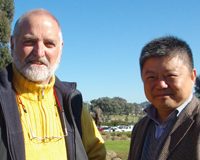 Professor Cui, who attended a Ramsar Workshop on Detecting Change in Ecological Character held at Queenscliff last week, has spent a few days in North-East Victoria during November catching up with Institute Director Professor Max Finlayson. The pair are working on a paper about a wetland monitoring network Professor Cui has established in China. 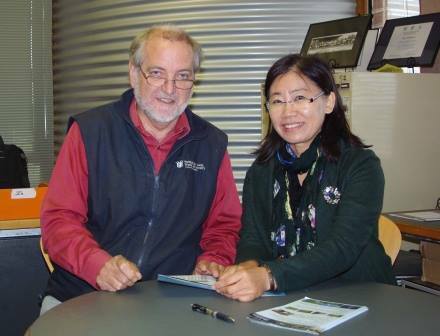 Catching up with our Japanese visitor Tomomi Maekawa on October 23 at the Albury-Wodonga campus was Karen Brisbane, a Victorian Landcare Corporate Partnerships Facilitator based in Shepparton with the Goulburn Broken Catchment Management Authority. Tomomi, a visiting student scholar and PhD student with the Tokyo Institute of Technology, is studying Landcare in Australia. Ms Tomomi Maekawa, who is a fellow with ILWS and PhD student with Tokyo Institute of Technology, was joined by her supervisor Professor Toshio Kuwako from Tokyo Institute of Technology, Professor Michael Seigel from Nanzan University and another Japanese expert, as well as the chair of Australian Landcare International Mr Rob Youl. 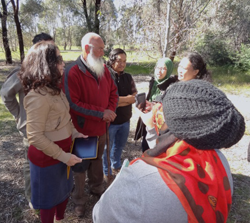 During their stay on the Border in mid September, the visitors met with local Landcare groups and ILWS research professor Allan Curtis, Australia's leading expert on the Landcare movement. 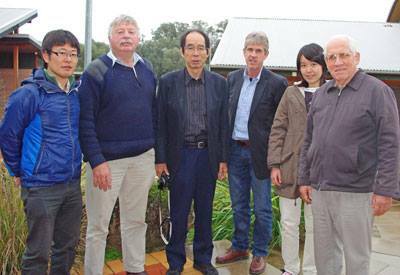 Photo from Left Dr Kazuki Kagohashi, Research Fellow from Nanzan University ; Rob Youl, President of Australian Landcare International; Prof Toshio Kuwako, Tokyo Institute of Technology (and Tomomi's supervisor); Prof Allan Curtis, ILWS; Tomomi Maekawa, a visiting student scholar (Doctoral) from Tokyo Institute of Technology, and in Australia for a year based here at CSU's Albury-Wodonga campus; and Prof Michael Seigel, from the Nanzan Institute for Social Ethics, Nanzan University. 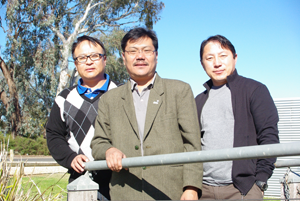 In August Dr Tashi Samdup from Buhtan took the opportunity to discuss the progress of two Bhutanese PhD student researchers Kuenga Namgay and Karma Tenzing — Photo from left Karma Tenzing, Tashi Samdup and Kuenga Namgay at CSU Thurgoona. 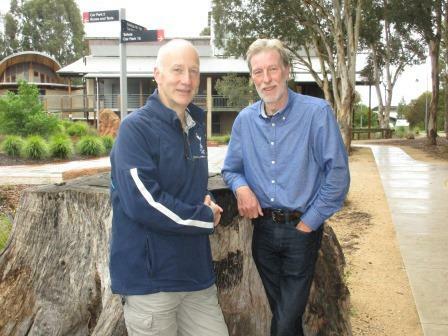 Independent environmental consultant Robert McInnes from the UK dropped in briefly at the Albury-Wodonga campus on Tuesday, April 30 where he met with ILWS PhD student Paul Amoateng to discuss their shared interest in urban wetlands in Ghana. Rob has just spent a couple of days with Institute Director Prof Max Finlayson, a fellow member of the Ramsar Convention's Scientific and Technical Review Panel. The two are co-editing a book on constructing wetlands for multiple benefits and are co-editors of a on-line virtual encyclopaedia on wetlands. Rob, who is doing work for UNESCO on water and natural resource management in the Lake Chad Basin in Africa, was also investigating parallels with the Murray Darling Basin and the lessons learnt that could be adapted to the Lake Chad Basin. 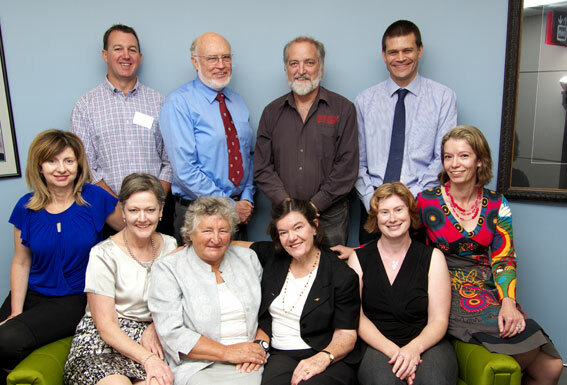 The Institute's new Advisory Board had the opportunity to meet with the University's Vice-Chancellor, Professor Andrew Vann, and Deputy Vice-Chancellor (Research) Professor Sue Thomas at its first meeting held at the Albury-Wodonga campus, on Thursday, March 14. The Board, chaired by Dr John Williams, were also given updates on some of the latest research being undertaken by ILWS members across a number of the Institute's Strategic Research Areas. After each presentation, Board members were invited to share their ideas and insights as a way of encouraging and guiding ILWS members. "I was invigorated by the day," said Dr Williams. "I so enjoyed hearing good science both social and biophysical, meeting with keen minds and engaged staff." Dr Williams said the Board's intention is to add value to ILWS's work and strategic positioning. It will produce a report from the meeting for the Institute and CSU management. Institute Director Professor Max Finlayson said Dr Williams' response illustrated a successful first up meeting. "I felt that the AB members felt welcomed and part of ILWS, and were certainly keen to listen and engage....a good start." Visitors to the Institute at the Albury-Wodonga campus on Thursday, March 7, were two representatives from the Lachlan Catchment Management Authority, Fin Martin, the CMA's Acting Program Manager, and Joanne Lenehan, its Acting Water Theme Leader. 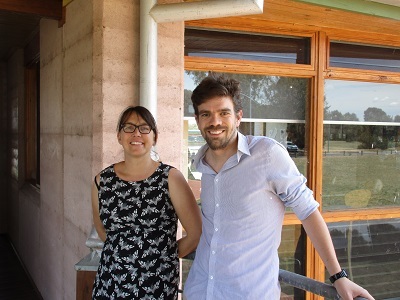 While here the two attended a special ILWS morning tea and then had a meeting with researchers and new Institute PhD students to discuss the projects underway in the Lachlan catchment in NSWs Central West. the Lachlan CMA is one three CMAs involved in a project funded by the National Climate Change Adaptation Research Facility to identify low risk ways to mitigate and adapt to climate change. 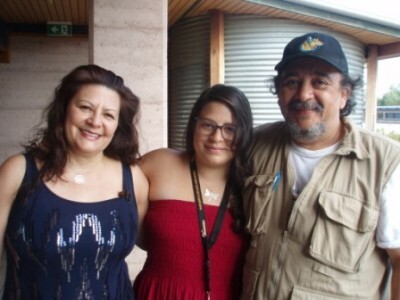 The Institute's PhD student from Mexico, Luisa Perez Mujica held a morning tea at the Albury-Wodonga campus on Wednesday, March 13 to introduce her parents, Tere Mujica and Luis Perez, who are from Mexico City and in Australia for three weeks, to her ILWS colleagues and friends. "So far, they love Australia, even though it is a bit too dry for them," says Luisa. "They enjoy the calm and tranquillity Albury provides and are thankful for not being woken up by car horns every morning. 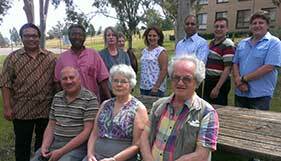 They love the local produce and how warm and friendly people in Albury have been towards them."